Lenovo has launched two new Android budget tablets at CES 2015 event in Las Vegas. 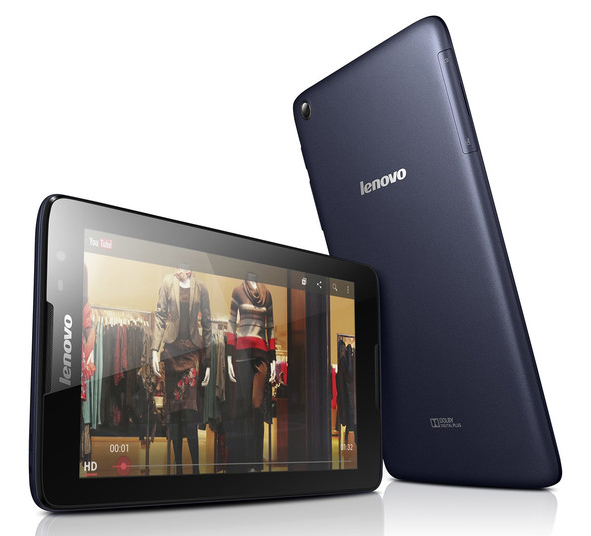 Both the tablets, named Tab 2 A7-10 and Tab 2 A7-30 comes with a price tag of $99 and $129 respectively. It will hit the shelves this month. The 3G variant with Voice calling of Tab 2 A7-30 will land the shelves in March. Both the tablets features 7-inch display with a pixel resolution of 1024 * 600, resembling pixel density of 170 ppi. Android Kitkat v4.4 will be the OS platform. There is no official announcement on its update to Android Lollipop v5.0 yet. RAM will be of 1 GB and external support to increase storage via. microSD card will be of 32 GB. Both comes with 0.3 MP camera on front. For better Audio enhancement, Dolby sound technology has been embedded in the tablet speakers. Tab 2 A7-30 had been powered with 1.3-GHz MediaTek MT8382 quad-core processor and Tab 2 A7-10 comes with 1.3-GHz MediaTek MT8127 quad-core processor. Inbuilt storage with Tab A7-30 is of 16 GB followed by 8 GB in Tab A7-10. Tab A7-30 has been equipped with 2 MP camera on back but Tab A7-10 misses out rear camera. Tab A7-30 comes with 8.9 mm thickness which is slightly thinner than Tab A7-10 which measure 9.3mm. Both the Tablets measure same in terms of Dimensions i.e. 190.5 * 104.1 mm and weights 269 grams. Tab 2 A7-30 comes in 4 color variants i.e. Ebony black, Aqua blue, Cotton candy or Pearl white. While, Tab 2 A7-10 comes in Ebony Black color only. Big tablet manufacture giants are coming with budget tablets. Samsung is also planning to launch the budget tabs, it would be very tough for users to choose from.